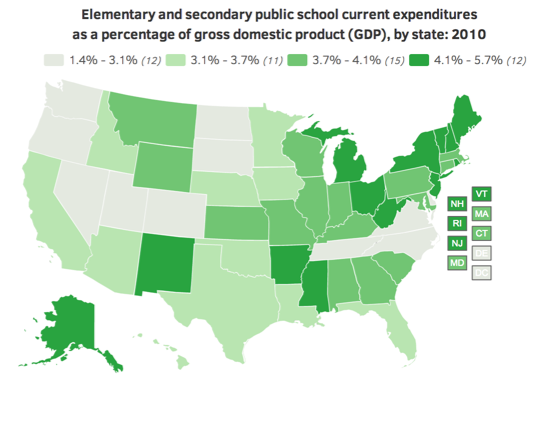 Among individual states, the average for spending on elementary and secondary education ranged from 2.47% to 5.67% of the state’s GDP in 2010, indicating that some states were directing a much higher percentage of their resources toward elementary and secondary education. Per pupil spending on day-to-day operations grew nationwide from $6,911 in 2000 to $10,652 in 2010, an increase of 54% in unadjusted dollars. This was equivalent to an increase of approximately 23% after adjusting for inflation. Spending for elementary and secondary public education as a percentage of the state’s GDP decreased in 10 states during the 2000-10 period. Several states spending the highest percentage of their GDP on elementary and secondary education had relatively small student populations (100,000–300,000), suggesting that some level of expenditure for educational infrastructure may be largely independent of the size of the student population. Several states that ranked in the lower two quartiles of expenditures per pupil ranked in the upper quartiles of the National Assessment of Educational Progress indicators. 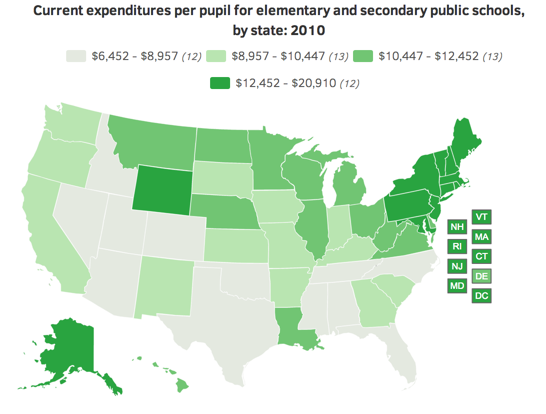 Per pupil spending in individual states varied widely, ranging from a low of $6,452 to a high of $18,167. The District of Columbia had the highest per pupil spending of any jurisdiction at $20,910.